Following his arrival in Veszprém during the summer of 2017, it was announced on Friday that French left back William Accambray has been loaned to Slovenian side Celje for the rest of the 2018/19 season. The 30-year-old will be able to play in the national league immediately but will have to wait until the beginning of November to take the Champions League court. Accambray is likely to make his first European appearance with his new team against Zaporozhye on November 4. After Igor Anic, Accambray is the second French player to be welcomed by Celje – but the first who has won three World Championships (2011, 2015, 2017) and one EHF EURO, in 2014 in Denmark. Before joining Veszprém, Accambray played for Montpellier and Paris Saint-Germain. Playing for Celje in Group B, Accambray will come up against his former club PSG in the Champions League Group Phase. “Celje was a good opportunity for me as they are a famous club and have a good team. Celje are young but ambitious. They showed this season against Flensburg that they were an excellent side. I’m really happy to join them and looking forward to join my new teammates,” Accambray told Celje’s official website. 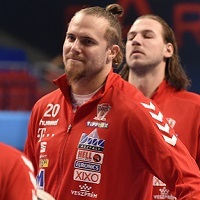 Accambray did not take part in Veszprém’s first three Champions League games this season, but played four Hungarian League games, in which he scored six goals.